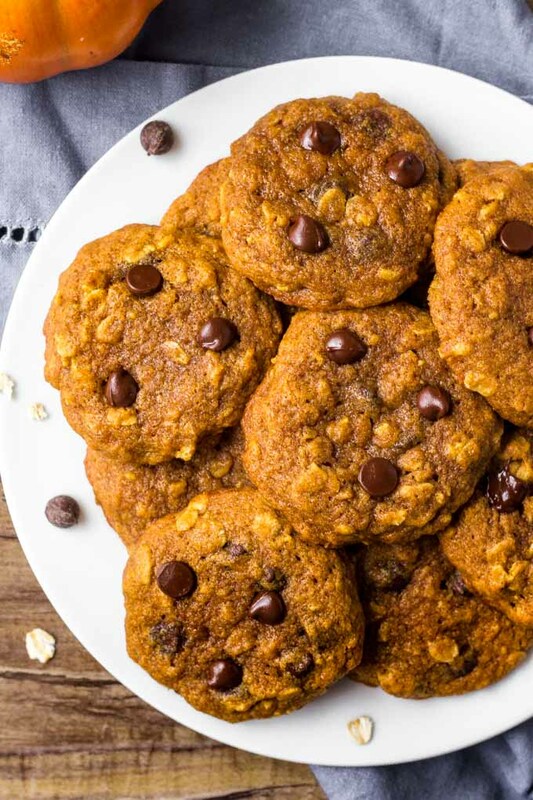 These Oatmeal Pumpkin Chocolate Chip Cookies are made even better for you with the addition of whole wheat flour! They are chewy and delicious and sure to be gone in minutes! With the holidays fast approaching, I’ve started thinking about gift giving. I love to give small treats and trinkets to our neighbors and friends. 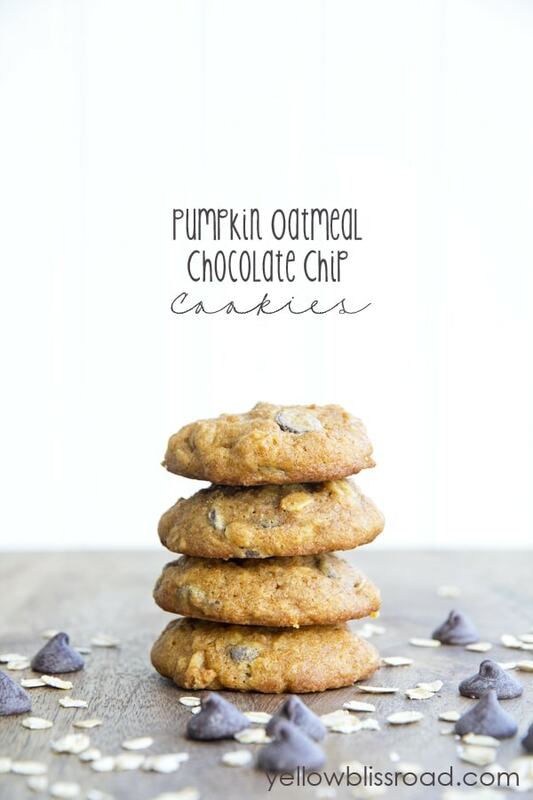 Cookies are always an easy treat to make and give and I’ve been wanting to try out a recipe that I recently came across from Two Peas and Their Pod for Pumpkin Oatmeal Chocolate Chip Cookies (recipe below). They looked and sounded delicious, and I knew it would be the perfect opportunity to try out the sample of pumpkin puree I had in my cupboard. 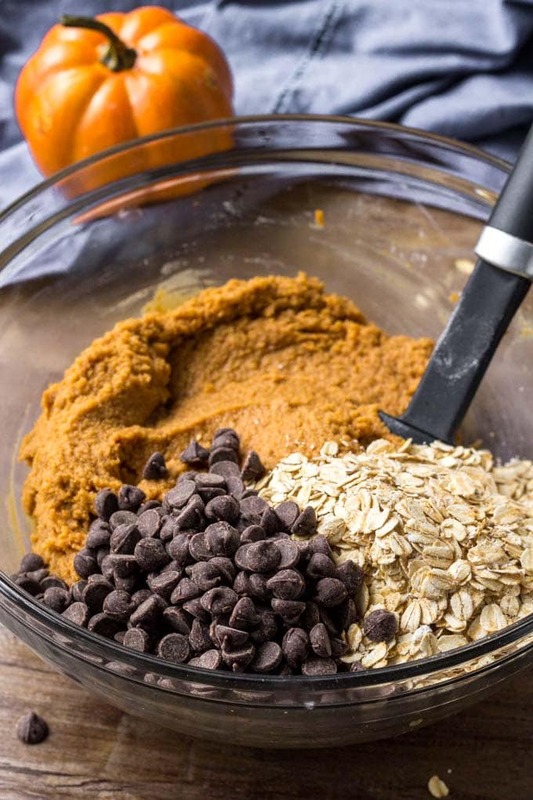 Dry ingredients: A combination of whole wheat and all-purpose flour, oats, baking soda, salt, pumpkin pie spice, cinnamon and of course chocolate chips. Wet ingredients: Butter, white and brown sugars, pumpkin puree (not the pie filling), egg and vanilla. Whisk together the flours, baking soda, salt and spices and set aside until ready to mix. Cream together butter and sugars until smooth and fluffy. (Creaming is a process where butter and sugar are beaten together until they are a light and creamy consistency. Add the pumpkin puree, egg and vanilla and beat until well combined. Slowly mix in the flour mixture just until combined. This is the point where you can literally watch the flour disappear into the batter. You don’t want to over mix of you could end up with a very dense cookie. 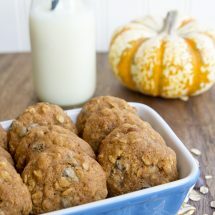 Fold the oats and chocolate chips into the batter just until they are incorporated evenly. Drop the by rounded tablespoons onto a cookie sheet. I always, always use my medium cookie scoop for baking cookies. It yields a perfectly rounded, evenly distributed cookie every single time. Bake in a preheated, 350 degree oven for 10-12 minutes or until cookies are lightly brown brown on top. Let them sit on the baking sheet for a few minutes after removing them from the oven to let them cool slightly, before transferring them to a wire rack. DO I HAVE TO USE WHOLE WHEAT FLOUR? No, you can use any mix of flour you like. Use the half and half method that I use, or use all whole wheat, or all all-purpose flour. The whole wheat flour will yield a little bit denser cookie. 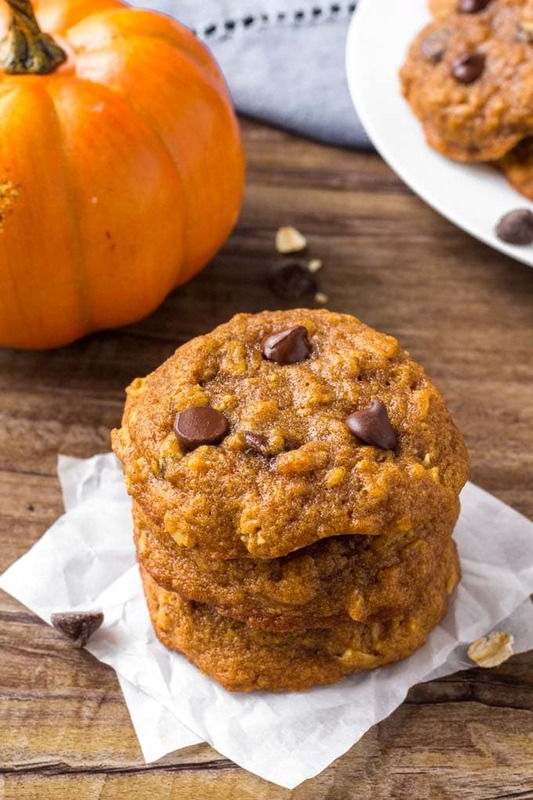 HOW LONG DO THESE PUMPKIN COOKIES LAST? 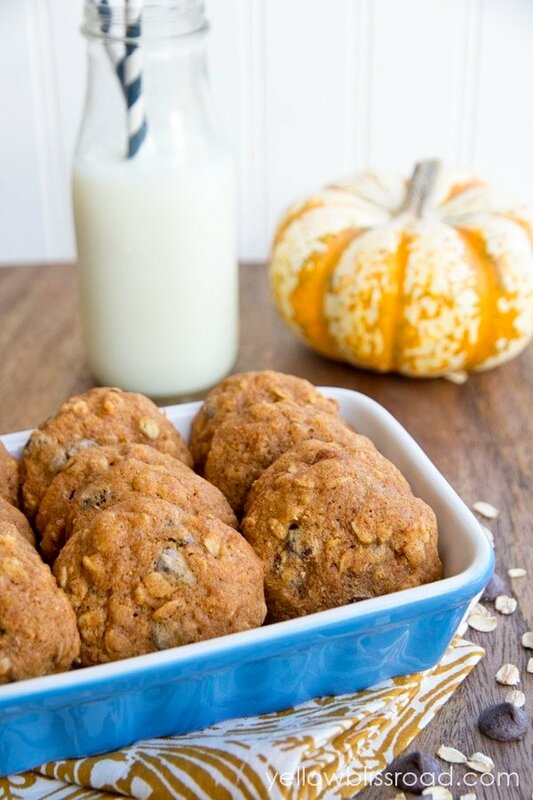 Pumpkin Chocolate Chip Cookies will last several days if stored properly in an airtight container in the fridge. To store, layer cookies in an airtight container, with sheets of wax paper or parchment paper between them to prevent sticking. 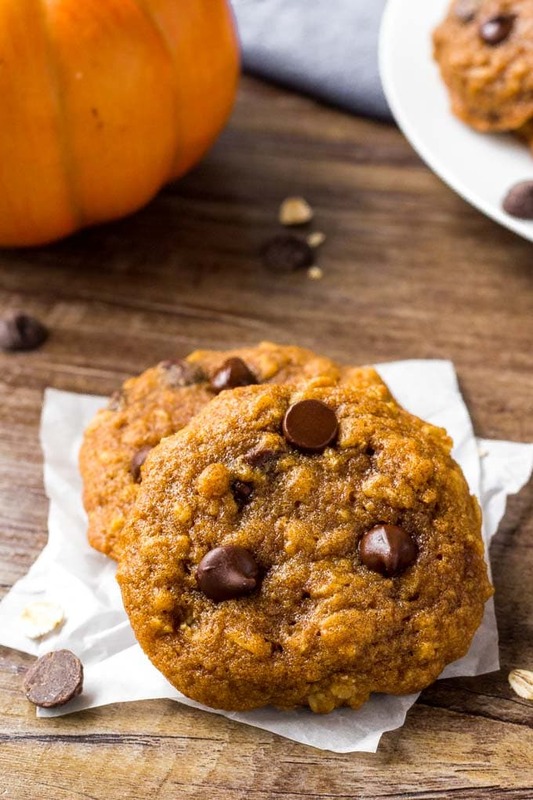 CAN CHOCOLATE CHIP PUMPKIN COOKIES BE FROZEN? Absolutely! These cookies freeze beautifully when stored in an airtight container, layered with sheets of wax paper or parchment paper between them to prevent sticking. You could also store them in ziplock bags in a single layer. WHAT ELSE CAN YOU MAKE WITH PUMPKIN? AirBake Cookie Sheets – Air insulation prevents top sheet from overheating which prevents burning. Silicone Baking Mat – Your cookies will slide right off of this perfect baking mat, no sticking! Medium Cookie Scoop – Get perfectly portioned cookies with a nicely rounded top every time! Whisk together the flours, baking soda, salt and spices. Set aside. Cream together butter and sugars until smooth and fluffy. Add pumpkin, egg and vanilla and beat until well combined. Slowly mix in the flour mixture just until combined. Stir in oats and chocolate chips. Drop by rounded tablespoons ( I prefer to use a cookie scoop) onto a cookie sheet. Bake in a preheated, 350 degree oven for 10-12 minutes or until cookies are lightly brown brown on top. Allow to cool for a couple of minutes before transferring to a wire rack. Adapted from Two Peas and Their Pod. For all things Fall go HERE, for all cookies go HERE and for all desserts go HERE. You can find the Recipe Index HERE. These cookies look so delicious! I love pumpkin anything! All you need is croissant rolls, pumpkin puree, sugar and cinnamon. Whenever we cook a Turkey in my home whether it be for Thanksgiving or another holiday or just to make since we like it a lot, almost nothing goes to waste. The leftovers are used to make yummy sandwiches for the next few days and the bones/carcass is used to make a delicious broth/soup. I always use carton chicken stock for my Southern style homemade chicken and biscuits. I also use carton pumpkin puree to make some delicious pumpkin coconut soup. Use left over turkey for sandwiches! I also buy cartons of chicken stocks for soup. I use the Pacific butternut product in some delicious Chicken Curry Squash soup! Love to use stock in a box in my white chicken chili. My favorite “smart” entertaining tip is to use reusable glass bottles like these – http://www.playpartypin.com/2013/09/make-it-monday-diy-glass-milk-bottles.html – instead of cups! These look so yummy! Thanks for the recipe and great photos. I love to use the chicken broth in a carton for gravy or soup. It’s easy to store the remaining in the fridge without dirtying up another container. I use stock in cartons to add extra liquid and flavor to soups. I prefer making my own stock, but sometimes, life gets in the way! I use carton chicken broth for a white chicken chili recipe! I buy chicken broth in a carton when I make soups – – like my Mom’s famous pumpkin curry soup! Yum! Thanks for the reminder to be environmental conscious when shopping at the grocery store! Carton pureed pumpkin is perfect to use in a pumpkin spiced smoothie, or to use in a pumpkin cheesecake. I use chicken broth from cartons to make homemade chicken noodle soup! I use beef broth from a carton to make my pot roast.